Making his second appearance at Baur’s Listening Lounge, Music Appreciation Society is pleased to present the ingenious music of A.J. Croce. This performance is certain to delight listeners and fans of great songwriting and playing. 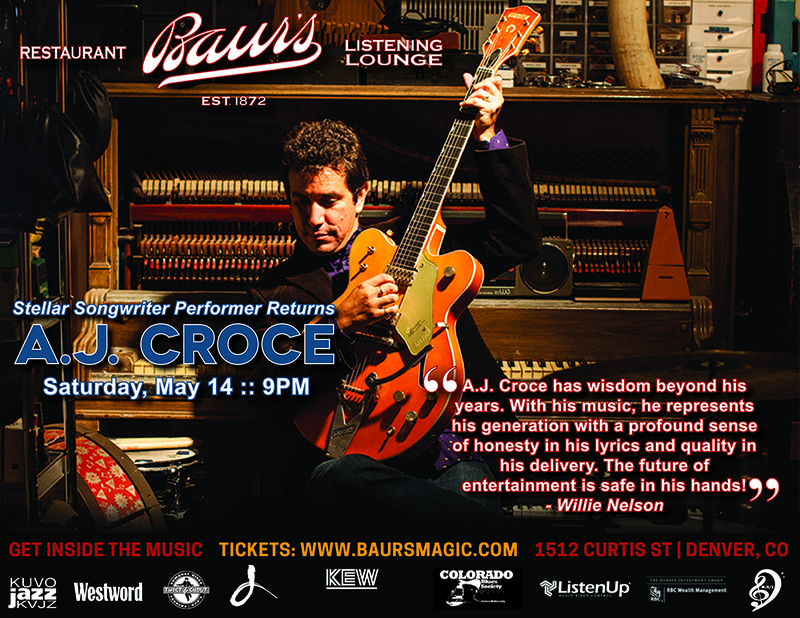 Hailing from Nashville, Croce is a Denver favorite who always delivers spectacular piano work and unmistakably original music. If you missed A.J. the first time – this is your chance to become enlightened and hear him perform live on Baur’s Steinway grand piano. From his debut as a jazz influenced blues-based artist to his evolution into a pop music iconoclast, singer-songwriter A.J. 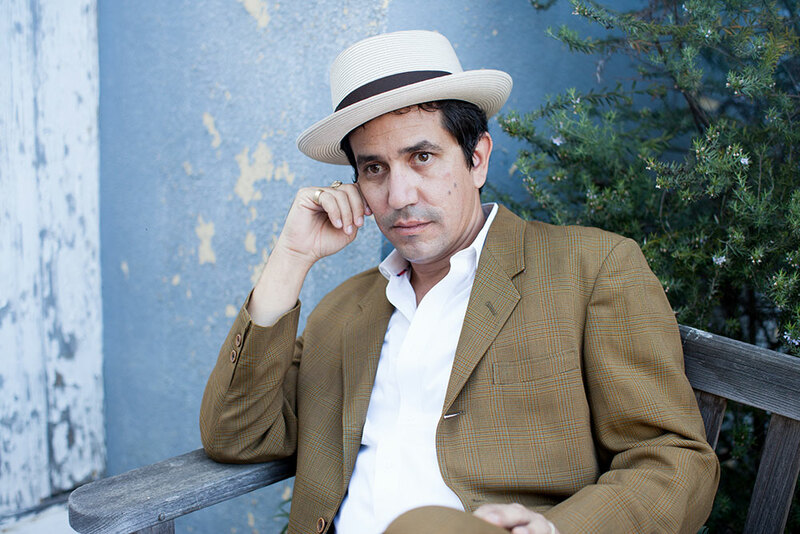 Croce has traveled a circuitous musical road. Now, with Twelve Tales, A.J. unveils his most ambitious recording project to date: A dozen new tracks recorded by legendary producers across a variety of American cities to be released one song each month in 2013. A.J. recently signed with Compass Records Group (Colin Haye, Victor Wooten), an independent label that has been touted by Billboard Magazine as one of the leading labels of the past decade. “Twelve Tales” features notable producers including some of the last work by the New Orleans’ ambassador of funk Allen Toussaint (Dr. John, Paul McCartney, Elvis Costello who passed away last year); five-time Grammy winner Kevin Killen (Elvis Costello, Peter Gabriel) in Stamford, CT; Grammy and Golden Globe nominee Mitchell Froom (Crowded House, Los Lobos), Tony Berg (Fiona Apple, Bob Dylan) in Los Angeles; Nashville’s illustrious late “Cowboy” Jack Clement (Johnny Cash, Jerry Lee Lewis); and finally Greg Cohen (Tom Waits, John Zorn) in New York City. 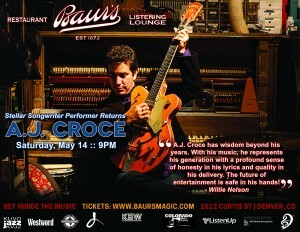 The son of legendary singer-songwriter Jim Croce, A.J.’s career began with his first tour at age 18 opening up for B.B. King. In the span of a 20+-year career, A.J. has headlined festivals, concerts and major listening venues worldwide. He has been seen and heard on shows including Jay Leno, David Letterman, Conan O’Brien, Austin City Limits, Good Morning America, E!, and CNN, and he has shared the stage with an innumerable list of eclectic artists from Willie Nelson to Ray Charles, Bela Fleck to James Brown, Lyle Lovett to Morphine, and Rod Stewart to Ben Harper. A loyal and appreciative audience and glowing press from Rolling Stone to the New York Times confirms the appeal of A.J’s genre-spanning music, with six of his albums positioned in various radio charts including Top 40, AAA, Americana, College, and Jazz. An ivory-searing New Orleans piano style established an essential juju, but his exploratory pop gems revealed a spectrum of influences from art rock to Americana and beyond. Initially signed as a jazz artist, he subsequently charted with an Americana roots release and recorded two well-regarded releases for BMG Records that expanded his audience exponentially. His subsequent albums were released on various independent labels and his own label, Seedling Records, established in 2003 to release his own records and that of other artists. Having spent the past three years in Nashville where a packed weekly schedule of co-writing sharpened his writing to a keen edge, A.J. says that back home in California his song craft took an instant turn. “I began writing for myself again,” he confirms. He has recently begun collaborating with the great Leon Russell (“A Song for You”, “This Masquerade”). “It’s a thrill and a little surreal to collaborate with Leon Russell. He’s been an influence and an inspiration as long as I can remember,” says A.J. A dedicated family man, an adventurous artist and a confident creator; in this phase in his life and career, A.J. is focused less on expectations and more on instincts. “I generally want to do the stuff that makes me feel good,” he says. And like the blues greats who influenced him, A.J. Croce continues to create stellar music with longevity, authenticity and truth. Twelve Tales marks the latest milestone on his illustrious journey. Music Appreciation Society and KUVO invite you, your family, and friends to an intimate evening with A.J. Croce. This courageous and talented musician is performing for a second time at Baur’s and we hope you can make it.